The proven battle pistol is back and better than ever. The legendary Beretta® 92 not only won the historic contract with the US military in 1985, but a contract renewal after more than two decades of hard use in the world's toughest and most extreme conditions…from the scorching deserts of Iraq to the frigid heights of the Afghan mountains. A contract renewal after this kind of use and abuse means the gun kept its promises—and then some. 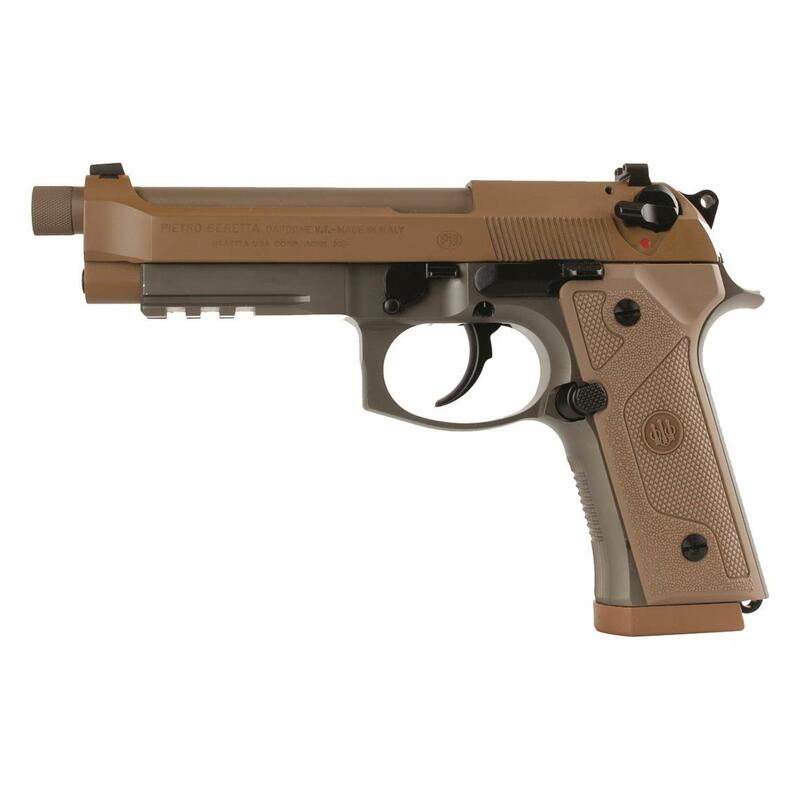 The M9A3 represents the latest generation of improvements to the legendary battle pistol. These improvements help push it to the cutting edge of modularity, reliability, durability and ergonomics. 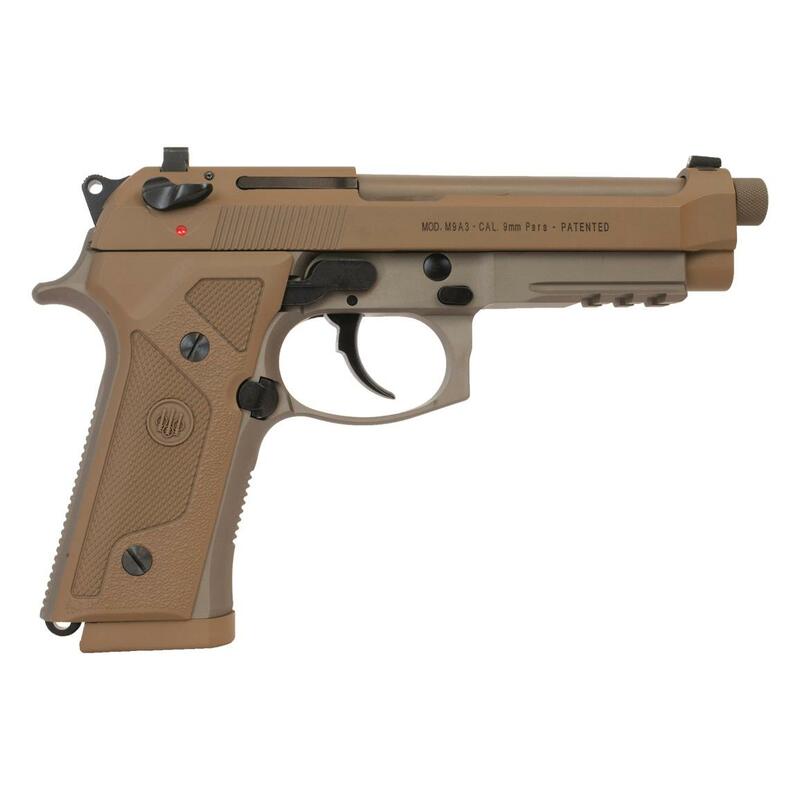 From the Vertec-style thin grips to the beveled magazine well, from the oversized mag release to the 3-slot Picatinny rail, the M9A3 was designed to deliver the performance that military, law-enforcement and VIP-protection professionals demand. Vertec vertical grip offer two very important benefits. Its vertical configuration makes it easy to point the handgun to where one would normally point the index finger of the dominant hand. This instinctive pointing is highly prized by tactical shooters and makes for consistent--and consistently-accurate--target acquisition. Checkering on the front and backstraps helps you hold on tight. The M9A3's universal slide converts from safety-decocker mode to decocker-only mode. The tritium front sight is removable and can easily be replaced. And the M9A3 is low-maintenance thanks to tool-free takedown, sand-resistant magazines, and hyper-resistant FDE finish that's practically impervious to the elements. Whether it’s on duty, at home, for concealed carry or at the range, the M9A3 will always give you the absolute best of Beretta’s centuries-old experience and long history serving the needs of professionals the world over. Beretta M9A3, Semi-Automatic, 9mm, 5 Threaded Barrel, Flat Dark Earth, Type F, 17+1 Rounds is rated 5.0 out of 5 by 1. Rated 5 out of 5 by mcdo1dan from Outstanding 9MM SA Pistol The Beretta M9A3 is truly an outstanding firearm. Designed for the military, it comes with features and quality that you will use, and depend on. It is nicely balanced. It is accurate. It is very easy to break down, clean, and reassemble. This FA is well worth the price and will serve you flawlessly for a long time when properly maintained. Military units serving around the world have and continue to use this firearm daily.